You win Wimbledon, you win the US Open, you win the Olympic Games, you win the year-end championships plus three other tournaments in single season and yet you are still only the third best female tennis player in the world – at least according to the silly computer rankings. This is the situation with Serena Williams who earlier today won the WTA championships decisively over Maria Sharapova in Istanbul. So what in the name of Caroline Wozniacki, Dinera Safina and Jelena Jankovic is going on here? Basically, the computer is a joke and has been for a long time. It needs to be tweaked so that the winners of the grand slam tournaments get considerably more points because the top spot, once so prestigious, has largely become the real estate of the player who is able to grind out the most matches at lesser tournaments and either gets outplayed or chokes at the majors. Serena may not have played as much as the other girls but she did have a stellar 58-4 win/loss record this year. At least top-ranked Victoria Azarenka won the Australian Open and was the runner-up at the US Open while second-ranked Sharapova won the French Open and was runner-up at the Australian and at the Olympics. But Williams had the best year and the rankings do not reflect that. She barely has more points than Agnieszka Radwankska! 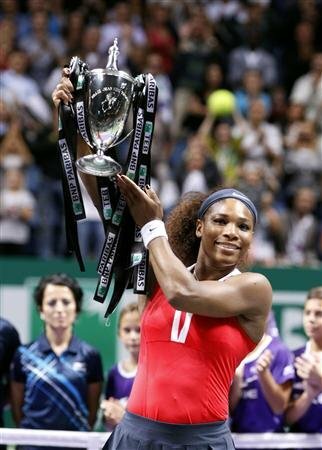 Anyway, Serena is plenty happy to have won the year-end championship for the third time. At 31, Serena is the oldest player to have won the year-end title. No, she didn’t need it. Because we already know she is the best player in the world right now and one of the greatest of all time. Someone just needs to tell the WTA computer! She has won 12 straight against opponents ranked No. 1 or No. 2 and has not lost to a player ranked in the top 2 since 2007. Have to say I agree with you 100% on this one, the WTA computer is a joke, but, the last laugh is with Serena, what a great year! !